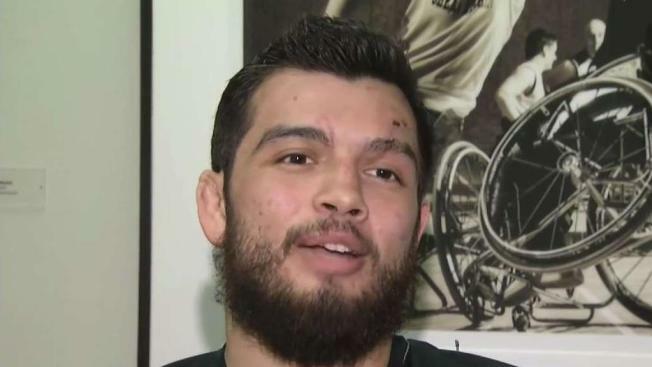 For the first time since he fell more than five stories off a highway overpass, a San Jose mixed martial arts fighter is talking about what happened. NBC Bay Area's Damian Trujillo reports. For the first time since mysteriously falling more than five stories off a highway overpass, a San Jose MMA fighters is talking about what happened. Sam Romero says he still can't remember the incident, but knows what he wants to do when he gets out of Valley Medical Center. His comeback will be tough and long, but Romero says he is up for the fight. "It was pretty scary," Romero says. "Sometimes I think about it at night when I'm laying down. I sit up and think about everything that happened." The fall occurred the night after his last MMA fight. He was out with friends for dinner and drinks when he either fell or was pushed off a Highway 87 overpass. Romero fell six stories before landing partly in the Guadalupe River. Romero says he still does not remember exactly what happened. A jogger found Romero some eight hours later and called 911. "I know I'm a little banged up, but thankful to be alive," Romero said. San Jose police referred Romero's case to the California Highway Patrol, but so far there are no leads and no evidence of what exactly lead to the 60-foot plunge. The other mystery is the name of the jogger who found Romero. "I just want to say thank you for everything," Romero said of the jogger. "Without you, I probably wouldn't be here." Meanwhile, Romero will continue rehabbing and hopes to return home soon.